One technique is to do the math. Add or subtract 180° from you forward bearing to get your back bearing. 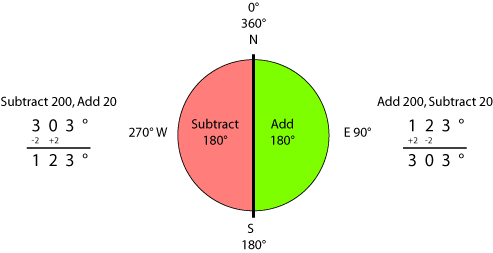 You want the result to fall between 0° and 360°, so if the forward bearing is less than 180°, add 180° to it, and if it’s greater than 180°, subtract 180°. If you are bad with math in your head, the “200/20” trick might help you. When your bearing is less than 180°, add 200° and then subtract 20° (same as adding 180°). When your bearing is greater than 180°, subtract 200° and then add 20° (same as subtracting 180°). Forward and back bearings as seen through a sighting compass. 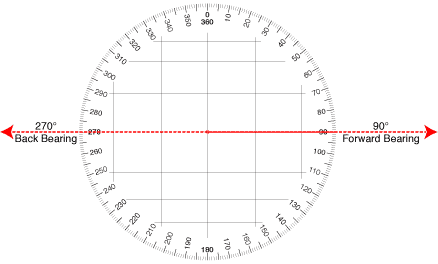 Most sighting compasses show the back bearing in a smaller font size above or below the forward bearing. When you are taking a bearing with a base plate compass, and you want a back bearing instead of a forward bearing, box the compass needle with the south end where the north end would usually be. The resulting bearing will be 180° different. 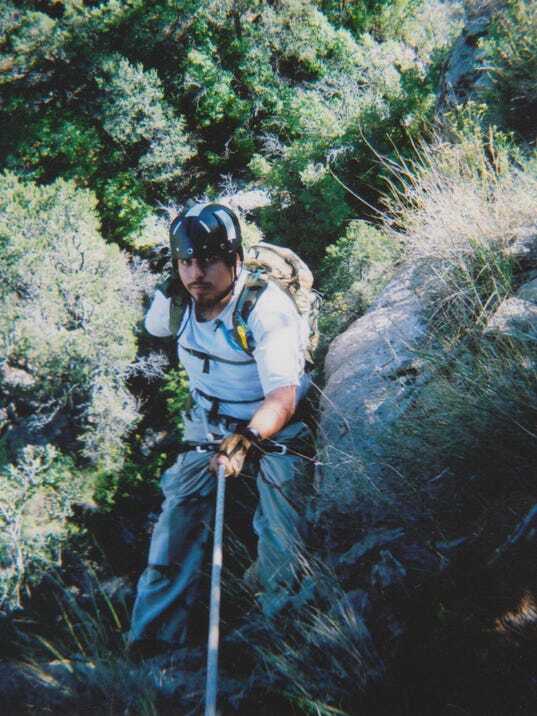 Aligning North needle with South for a back bearing. When you are plotting your bearing, start by plotting a short segment of the forward bearing. When you extend the line, extend it in the opposite direction. 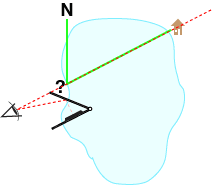 Plotting a back bearing with a protractor. Next get straight in your head, where you will be plotting the bearing from on the map, and whether you will be plotting a forward bearing or a back bearing. You will always be starting to plot your bearing from the known location and then extending your line towards the unknown location. If you took the bearing from the known location, you will be plotting a forward bearing, starting at the known location. If you took the bearing from the unknown location, you will be plotting a back bearing, starting at the known location.